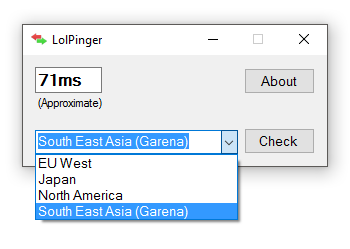 LolPinger is a Software to check ping of League of Legends game servers before playing the game. This helps you make sure you won't lag while playing the game. v1.0.1.0 : EU Nordic & East Server added. v1.0.0.1 : Minor bug fix. Feature: Ping check for following servers: North America, EU West, South East Asia (Garena) & Japan. You might need Microsoft .NET Framework 4.5 to run LolPinger.